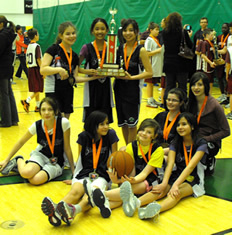 Our Sacred Heart School Girls’ 2012 Basketball Team are the Champions! They won the trophy, bringing it back to Sacred Heart School for the first time in over 30 years! A huge note of thanks to our Sacred Heart Knights of Columbus who sponsored this event for all the Catholic Independent Schools of Prince George at the amazing UNBC Sports Centre! Thank you also to our great coaches and teachers who volunteered their time and talents to training these young athletes of our school! Yeah, Sacred Heart!